Although the president’s signature legislation played a role in the continued growth of healthcare spending, the ACA is not solely responsible for this unsustainable trend. Every stakeholder, including providers, health insurers, pharmacies, federal and state governments, patients, and others, has a financial interest in the business of healthcare. In a country founded on capitalism, where competition accelerates innovation and drives down costs in virtually every other sector of the economy, it makes sense that the United States could sustain a healthcare system based on the same principles. However, that theory has not been true in practice. Although virtually every stakeholder that contributes to the US healthcare system does so with the primary goal of helping patients and improving healthcare outcomes, their parallel objective to earn a profit (an entirely reasonable expectation) has often added unintended consequences and costs to an already complex system. No sector of the healthcare economy wants to accept blame for skyrocketing costs, and so far, none has had to. With everyone adding to the cost of healthcare, a myriad of scapegoats exist. Politicians point fingers at pharmaceutical manufacturers, who in turn blame health insurers and pharmacy benefit managers (PBMs). Doctors complain about regulations and protocols enforced by payers and health system administrators, while patients remain unsatisfied with the quality and cost of their care. It seems that no one is satisfied, yet everyone (except the patient) goes home with their share of the profit at the end of the day. 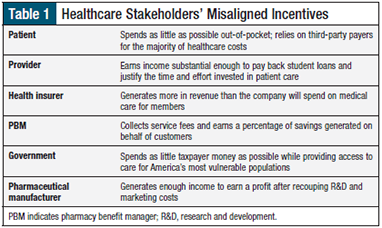 The central challenge facing the US healthcare system is not the motivation of stakeholders to earn a profit, but rather the misaligned incentives among healthcare stakeholders as outlined in Table 1, which drive up costs unnecessarily. Although at their core all healthcare stakeholders agree that enabling quality, cost-effective care for patients should be their primary concern, other factors often interfere. These misaligned incentives do not apply universally to every stakeholder, which adds more complexity to the system. 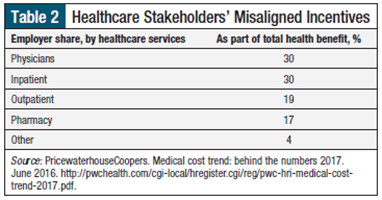 Each stakeholder has different profit motivations that drive up the overall costs of healthcare. Patients are the central figures in any healthcare system, and although they are often the victim of misaligned incentives, they also bear some responsibility for rising costs. Typically, patients are motivated to spend as little as possible out of pocket. They are conditioned to expect healthcare to be inexpensive or free, because the majority of their expenses are covered by a third-party payer (a commercial health insurance company or the government). Because patients may not value healthcare as a service in which they are willing to invest their own money upfront, they have little incentive to actively participate in reducing costs. Patients may be reluctant, for example, to make a dietary change to reduce cholesterol levels when a once-daily pill can achieve the same results. 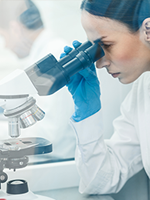 Pharmaceutical manufacturers are often at odds with payers and with PBMs, despite their shared focus on the patient’s best interest. 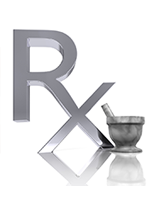 Payers and PBMs work on behalf of patients to control the cost of pharmaceuticals. Their motivation is to collect more in premium dollars than they spend on healthcare services for their members. They negotiate with manufacturers for the best possible price and organize their formulary accordingly, making lower-cost drugs available to patients with a lower cost-sharing responsibility. By contrast, drug manufacturers charge a higher price for their drugs to account for payer coverage gaps, formulary placement and restrictions, and the rebates and discounts required in the distribution and reimbursement channel. In addition, pharmaceutical manufacturers need to recoup their substantial investment in research and development, as well as marketing and other expenditures needed to bring the drug to market and achieve uptake among physicians and patients. When accused of setting their prices too high, as has often been the case in recent years, manufacturers respond that the price they set is rarely (if ever) the price paid by patients, as a result of rebates and other discounts. Oddly enough, approximately only 1 in every 100 New Drug Applications makes it to the market,7 and little mention is made of these losses in the media. Similar to pharmaceutical manufacturers, providers must also negotiate for reimbursement with public and private payers. In geographic markets where an insurer is a dominant player, physicians may have little choice but to accept the reimbursement offered by the insurer or risk going out of business because of a diminished volume of patients. Physicians must also follow the protocols put in place by payers that are designed to improve the quality and consistency of care provided to a population of patients. This practice may limit physicians’ autonomy and may negatively affect individual patients whose circumstances do not fit the standard care model. Payers argue, however, that their oversight is necessary to prevent unnecessary charges that result from the fee-for-service reimbursement model that has been prominent for decades. In a fee-for-service model, providers are incentivized to provide more services, but not necessarily higher-quality care. Payer management serves as an agent for consumer protection, but budget constraints and rapid increases in healthcare spending have emphasized financial concerns. The government has a slightly different motivation from other healthcare stakeholders, because it does not earn profit, but it seeks to save money where possible while providing access to care for America’s most vulnerable populations. In 2015, for the first time government-sponsored programs surpassed the private industry; these programs now represent the majority of healthcare spending in the United States.8 Medicare covers approximately 57 million elderly and disabled people,9 whereas Medicaid and the Children’s Health Insurance Program serve as a safety net for more than 70 million children and low-income adults.8 Medicaid is the largest single payer for maternity care, childbirth, mental health services, and long-term care in the United States.8 Despite the government’s strong negotiating leverage, which enables it to obtain substantial discounts from providers and pharmaceutical companies, taxpayers are paying more for their own healthcare and for subsidized care provided to Medicare and Medicaid beneficiaries.8 Americans with private health insurance spend $5380 per person (on average); by comparison, Medicare paid nearly $12,000 per enrollee, and Medicaid programs spent almost $8000 per member (on average) in 2015.1 The government has a lot at stake and has taken this responsibility seriously; in addition to playing the role of payer, it also serves as a regulator. This is a fairly recent stronghold linked to the ACA and its supporting regulations. Medicare, for example, has more pages of regulations than the Internal Revenue Service’s tax code,10 and is considerably more complex. Although we do not advocate for a government-run solution to America’s healthcare-spending crisis, we understand the frustration that motivates supporters of this proposed solution. Instead, however, we would prefer to see the US healthcare system work as it was intended: with uninhibited consumer choices; with competition for business among providers, pharmacies, pharmaceutical manufacturers, and payers; and with taxpayer-funded and charitable financial support for those in need. It is the responsibility of all stakeholders to stop looking for a scapegoat and to begin participating in the solution. Mr Branning and Ms Vater are with Managed Market Resource, which provides consulting services to many pharmaceutical companies. 1. Herman B. Healthcare spending growth rate rises again in 2015. Modern Healthcare. July 13, 2016. www.modernhealthcare.com/article/20160713/NEWS/160719963. Accessed July 14, 2016. 2. Herman B. HHS says ACA plans have reasonable deductibles. July 12, 2016. www.modernhealthcare.com/article/20160712/NEWS/160719979/hhssaysacaplanshavereasonabledeductibles. Accessed September 22, 2016. 3. 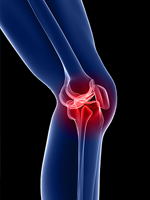 Ray W, Norbeck T. Rising medical costs force patients of all ages to make concessions. Forbes. July 18, 2016. www.forbes.com/sites/physiciansfoundation/2016/07/18/rising-medical-costs-force-patients-of-all-ages-to-make-concessions/#72f808713ecb. Accessed July 19, 2016. 4. Centers for Medicare & Medicaid Services. The nation’s health dollar ($3.0 trillion), calendar year 2014, where it went. www.cms.gov/Research-Statistics-Data-and-Systems/Statistics-TrendsR09;and-Reports/NationalHealthExpendData/Downloads/PieChartSourcesExpenditures2014.pdf. Accessed September 22, 2016. 5. PricewaterhouseCoopers. Medical cost trend: behind the numbers 2017. June 2016. http://pwchealth.com/cgi-local/hregister.cgi/reg/pwc-hri-medical-cost-trend-2017.pdf. Accessed July 14, 2016. 6. Pharmaceutical Research and Manufacturers of America. Prescription Medicine. Costs in context. Updated August 2016. www.phrma.org/sites/default/files/pdf/prescription-medicines-costs-in-context-extended.pdf. Accessed July 19, 2016. 7. Thayer AM. More drugs are succeeding in clinical trials: after a 15-year decline, chances are better that a drug will make it to the market. Chemical & Engineering News. 2016;94:13. 8. James E, Hughes M. Government-sponsored programs make up 52% of what we spend on healthcare. Forbes. July 29, 2015. www.forbes.com/sites/realspin/2015/07/29/for-the-first-time-government-programs-make-up-the-majority-of-u-s-health-spending/#67abbe828e1c. Accessed July 20, 2016. 9. Cubanski J, Neuman T. The facts on Medicare spending and financing. Issue brief. Kaiser Family Foundation. July 20, 2016. http://kff.org/medicare/issue-brief/the-facts-on-medicare-spending-and-financing/. Accessed July 20, 2016. 10. Brody WR. Is Medicare cost effective? June 13, 2003. www.hopkinsmedicine.org/about/Crossroads/06_13_03.html. Accessed August 31, 2016. 11. Obama B. 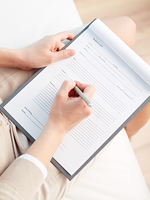 United States health care reform: progress to date and next steps. JAMA. 2016;316:525-532.